Network of Hamas terror tunnels destroyed during Operation Protective Edge is almost back to pre-war level, says Haaretz. The Hamas terrorist organization in investing great efforts and funds into rebuilding its terror tunnel network that was destroyed during Operation Protective Edge, according to Haaretz, and the number of reconstructed tunnels is nearing the amount of tunnels connecting Gaza and Israel prior to the 2014 operation. Thirty-two out of 49 “terror tunnels” were identified and destroyed by IDF forces during Operation Protective Edge. Roughly one-third of the tunnels were dug east of the security fence; on Israeli soil. Citing Haaretz, i24 news reported Tuesday that while it is unclear how many tunnels were rebuilt and how many were newly dug, the number of currently existing tunnels most likely is similar to their number before Protective Edge. Last December, Hamas mourned the loss of one of its members, a terrorist who once guarded Gilad Shalit in captivity. The terrorist, according to a Hamas announcement, was killed in a collapsed tunnel “east of Khan Yunis,” which essentially is Gaza’s border with Israel. 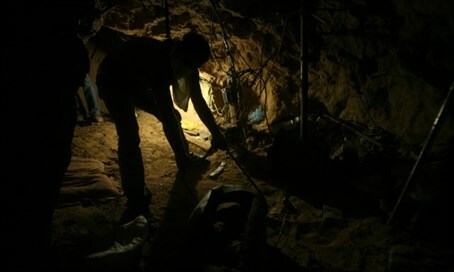 Reports that Hamas has been restoring its “terror tunnel” network are not news to the Israeli government. MK Omer Bar-Lev (Zionist Union) said as early as May of 2015 that Hamas "has returned to digging tunnels and one or more of them have crossed the border fence, attacking the sovereignty of the State of Israel." In August of last year, the IDF revealed that Israeli security forces had arrested a Hamas terrorist for actively planning tunnel terror attacks from within the Gaza Strip. Gaza Division officers also reported seeing construction work and digging in close proximity to Israel's border with Gaza.